[vc_row][vc_column width=”1/1″][vc_column_text]Technical Stuff – FAQ just for you. If you have a question about boat covers- your brand new cover… or even the one you have now that might have seen better days, you’ll probably be able to find the answer here. What fabric do I choose for my cover? This depends on you and your boat. Canvas Barn Marine Trimming recommends and uses acrylic canvas by Sunbrella®, and Stamoid® by Serge Farrari. Both these fabrics have proven themselves worldwide. Acrylic canvas is suited to traditional dodgers and timber boats. Stamoid comes in a variety of weights, is easy to clean and store. We will advise on the best fabric for your situation. There are many to chose from that will suit your boat. Be aware that red and burgundy may fade a bit faster than some other colours. What clear PVC do you use? – The highest quality products are Acrylic and Polycarbonate. They work extremely well in situations where clarity is of utmost importance. Fishermen chasing the big ones, and Yachties love it. These products cannot be rolled. They are either is hinged, or removed completely, meaning they are not suited to every situation. These are fabulous products… we love them! Acrylic has the advantage that small scratches can be carefully repaired. Ask if they are suitable for your boat. Clear PVC’s are available in three different varieties, calendared, extruded and polished. – Pressed Polished Sheets (PPS) – offer a special finish preventing minor scratching that may occur during washing, and handling. It also avoids most friction burns caused by rubbing against stainless framing bars. PPS provides great vision from all angles and in all atmospheric conditions. It has superior resistance to the ageing affects of UV rays when compared with other flexible window material. The pressing process gives a smooth surface that, combined with a surface coating, prevents the buildup of dirt. It prolongs the lifespan of the product and minimises yellowing. Sunscreen permanently marks some PPS. We recommend and use Strataglass. -Extruded Clear Roll Glass – is relatively stable, durable and chemically resistant material and with UV inhibitors added, one that is widely used in marine applications. The addition of plasticisers in a proportion of about 30% by weight provides flexibility, but also changes the material’s characteristics. Extruded glass moves and changes colour as the temperature changes, meaning a cover will loosen up considerably as the weather becomes warm, and will appear milky when the weather is wet. Canvas Barn Marine Trimming use Achilles Extruded Roll Glass Plus . with extra UV inhibitors. – Calendared clear’s transparency is very poor and Canvas Barn Marine Trimming chooses not to use it for Marine Applications. This depends on how you look after it. All covers need regular cleaning, after every use, big storm or environmental event such as birds roosting, bushfire or pollution close by. Salt crystals act like magnifiers allowing the sun to dry and burn the cover. Your cover needs to be tightly fitted. A flapping cover will rub and wear. Zips and fittings need to be properly done up. Clear enclosures need to be left closed after use. A well maintained, properly fitting cover will last many years. We use a PTFE (polytetrafluoroethylene) thread, it’s a big word, but guaranteed against breakdown from UV and acid (eg bird droppings.) PTFE thread has great abrasion resistance and colour fastness. It should outlast the rest of your cover!Our product of choice is Tenara thread by GORE. What zips do you use? Moulded zips in #10 size are used in most cases for joining covers together or creating openings in covers. These zips are available in both black and white. Black zips offer a higher UV resistance than white zips, and will last a bit longer if exposed to full sun. Coil zip is used for those smiley windows, because it can be curved.We use only YKK and Paskal zips, which are the highest quality, depending on application. What type of fittings do you use? Fittings and the fasteners used in covers and on the deck are stainless steel. These include eyelets and stay-put fasteners, press-studs and screws. Special fittings are available for tricky spots. This depends on the fabric. Acrylic canvas is water repellent, with a coating that fails in time. You might need to apply a new coating if this happens. Your cover needs to be clean and dry before reapplying. Stamoid is waterproof unless damaged. Why do I need a vent? Your boat will heat up and cool down carrying moisture up onto your cover. Each drop of water will carry dirt which then sticks to your cover. Mould will grow on the dirt, even though the cover itself is mould resistant. A vent will let the moisture out, keeping your boat ventilated and dry.The best type of cover is both waterproof AND breathable. Serge Ferrari make one such product, Stamoid SMART, which is 100% waterproof, and breathable. Being a silicon fabric, it is also extremely easy to clean! Can I leave my clear curtains rolled up for storage? No! Your cover needs to be fitted tightly to ensure a long life. If you have a problem getting the curtain to fit, try on a hot day. If you need to store you clear curtains, store them flat, with protective cloth between them, and reinstall them on a hot day. Can you reuse my old frame? This depends on the quality of your frame, and whether you want any changes made. If everything stacks up, it may be re-used. We prefer stainless steel frames, 25mm or 32mm, or aluminium 25mm. Thinner frames just don’t work well. Can't you just copy my old cover? In most cases, no. Fabrics can stretch and shrink with time, and we want your new cover to be fantastic. We prefer to start afresh. Can you make me new curtains now, and a new top in a year or so? If you think about it… your curtains hang from your top, and you want the fit to be great. So we start from the top down, and get everything fitted well as we go. It is really difficult to get that great fit by working in reverse. Each fabric has special cleaning requirements. The best way to extend the life of your cover is to keep it clean. And clean it regularly, and often. Once a year is not enough. Follow the manufacturer’s instructions. 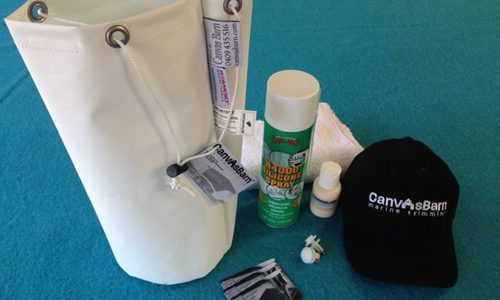 We provide a care kit with any new covers, which includes any special cleaning products you will need. We have some cool videos in our blog to help you. Refer to the care labels too. Do I have to bring my boat to you? In some cases, we can pattern your covers on your boat where it is moored. We can arrange slipping, and this often works in with the regular maintenance slipping for your vessel. What are your manufacturing techniques? ? We do things differently at Canvas Barn Marine Trimming. Our special fabrication techniques of laminating and bonding mean our covers are made to last a long long time. We have eliminated the need to use binding, so your covers have clean, sleek lines. Binding breaks down quickly, and catches dirt. All zips are covered, protecting them from UV light and water ingress. We insist on using the BEST quality fabrics to achieve the best covers. We will not compromise by using cheaper fabrics, and low quality frames. We also choose fabrics that are as environmentally “friendly” as possible. Canvas Barn Marine Trimming can work almost anywhere. Call us to talk about it. Check out our Blog for updates and information, email us info@canvasbarn.com or give Kym a call, 0409435516, and we can answer your questions!